This week, I put on my best cardigan, loaded up the mini-van and took the kids to see Wreck-It Ralph, starring John C. Reilly and directed by Rich Moore. 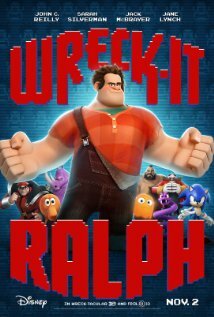 Wreck-It Ralph is a character in a classic video game called Fixit Felix Jr. Ralph is the bad guy who's signature phrase "I'm gonna wreck it!" starts every game. Of course, being the bad guy, Ralph finds himself face down in the mud at the end of every game. To the person playing the game, that's the end of it. To Ralph, it's just the beginning of his miserable existance. He lives in a dump while all the other characters in the game live in a lovely apartment building. Even when Ralph tries to interact with any of the other characters in the game, they shun him like the bad guy he is. The game in which Ralph is a character, Fixit Felix Jr., is about to hit a milestone as it celebrates 30 years in the arcade. Despite attending "bad-anon" meetings where Ralph hears from other classic video game villains that being the bad guy is ok (in the words of Zangeif from Street Fighter II, "Just because you are bad guy, doesn't mean you are ..bad guy), Ralph starts to feel like he's missing out always being the bad guy. Ralph then "goes Turbo" and starts jumping into other games (a big no no), trying to prove he can be a hero as well. The story is a little cliched, as usual for any Disney outing, but not badly written. John C. Reilly is good as Ralph, Alan Tudyk is great as King Candy but the real star and charmer of this film is Sarah Silverman as Vanellope VonSchweet, a lovable little scamp from a racing game called Sugar Rush. I was rather intrigued when I heard Silverman was cast in a Disney film. Her standup act isn't exactly kid friendly. Still, she does a fantastic job bringing this character to life. She's cute without going overboard and becoming "Disney-cute". The movie is a tad too long and there are definitely some slow parts, but the third act is all action and everything turns out pretty much as you'd expect. When I rate a kids movie, I usually look at two things. First, how well did my kids sit through the film without fidgeting, asking when it would be over or straight out looking to go home? Second, how often do they talk about or reference the movie once they've seen it? For Wreck-It Ralph, my kids hung in there pretty good (my son asked "how much longer?" about an hour in when there was some plot stuff going on) and they haven't stopped shouting "I'm gonna wreck it!" since we got back. Both of these facts point to a movie that captured their attention and kept it even after it was over. Which, for me, means it was worth the small fortune I spent taking them in the first place. If you're looking for a cute, endearing movie to take the kids to this weekend, you could do a lot worse than Wreck-It Ralph.